It’s a well-known fact that one of the best ways to save more is to spend less. Unfortunately, that’s often much easier said than done! However, you might already have a few easy places where you can cut back on how much money you’re putting out. To help you figure out how to save money on expenses, we’ve pulled together a few different places that you might be able to cut back. Keep reading for the full list. We’re not saying you should cut back on gym expenses because fitness and health is not important. What we are saying is that a lot of schools allow students to use the on-campus gym for free – and some even offer free classes! Rather than pay a monthly fee for an off-campus gym, check what the deal is on your campus, and take advantage of those benefits while you can! The scenario is all too familiar: you’ve just wrapped up a long day of classes, your stomach is growling like crazy, and the thought of trekking to the dining hall or cooking something from scratch makes you want to curl into a ball. When it comes to over-spending, food is one of the easiest money traps to fall into – and it’s not hard to understand why. However, endless takeout orders and trips to your favorite off-campus restaurant can add up – and fast. Instead of regular food-fueled spending sprees, take advantage of the meal plan you already paid for as much as possible – and get creative in the dining hall! If you don’t have a meal plan, grocery shop regularly and make your own dinners at home. View your next Seamless order or restaurant outing as a treat at the end of the week! Plus, find some healthy tips to keep in mind at the dining hall here. Pay close attention to where you spend your money on entertainment or outings with your friends. Do you go to the movies a few times a semester? Check if there are (free) movie nights on campus instead. Do you hit the place down the street for trivia every Thursday? Ask if they have specials or deals on another night of the week. You don’t have to give up everything you enjoy just to save a few bucks, but you should figure out if there is a cheaper way to enjoy those things! Even if you only head home a few times a year, there might be easy ways to save on the trip. If you’re traveling by train or plane, start watching prices early to ensure you get the best one – and don’t wait until the last minute to buy tickets. If you live within driving distance, ask around to see if anyone is headed nearby, and offer to split the gas if you can carpool. When it comes to travel, there are almost always savings opportunities…so keep your eyes peeled! Check out our Home for the Holidays Sweepstakes and enter for a chance to win everything you need to get you home. Click here to find out how to save money when traveling home for winter break. If you have a car with you at school, take a good look at what kind of money you’re spending on it during the semester. Parking, gas, and maintenance can quickly add up – and just aren’t worth it if you don’t really need to be driving anywhere. If leaving your car at home during the school year won’t make your life too difficult, consider making the switch. 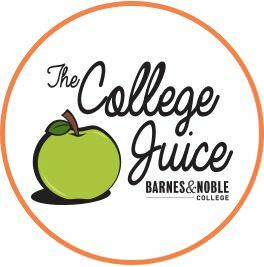 Powered by Barnes & Noble College, The College Juice is your healthy serving of daily blog perusal. When you’re putting off that paper or dodging that study session, you might as well read a blog that not only keeps you entertained but also helps you manage student life. We know college can be tough – Money and time are tight. Stress is high. But, with tips and advice from folks who know college all too well (those who have been through it and now work on campus), you’ll get through it all and reach your goals. From budgeting tips to study tools and guides, The College Juice is what you need to stay on track.